The fourteenth day of the battle of Kurukshetra was drawing to a close. 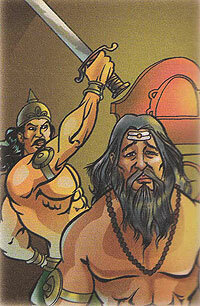 Drona was unhappy because neither could he capture Yudhisthira nor could he save Jaidrath. So he attacked the Pandava soldiers with more force than ever. Krishna told the Pandavas that Drona could be killed by a trick. Krishna asked the Pandavas to spread the false news that Drona's son, Ashwatthama, had been killed. Bhima killed an elephant named Ashvattama and shouted, "I have killed Ashvatthama." When Drona heard this, he was full of sorrow. He asked Yudhisthira whether it was true; he knew that Yudhsthira would never lie. Yudhisthira replied, "Yes, Ashvatthama is dead, but the elephant not your son." But Krishna asked the drummers to beat the drums when Yudhisthira spoke the last part of the sentences, so Drone couldn't hear it. He sat mourning his son's death and Dhrishtadyumna who had been born to kill Drona, cut his head off .